Saruni Mara has one family villa, one private villa and five cottages, and is the only small boutique lodge in the Mara, making it very intimate and exclusive. The beautifully decorated and individually themed rooms have a classic safari feel, with luxurious bathrooms and showers with a view. The lodge is tucked away in a secluded valley in Mara North Conservancy – a private and exclusive 74,000 acre wildlife concession bordering the Masai Mara National Reserve, the world’s most naturally rich wilderness. Encounter the abundant wildlife away from the crowds and uninterrupted by other vehicles. Enjoy the Italian-inspired cuisine, the relaxed and elegant atmosphere and being immersed in nature from your private veranda, the Maasai Wellbeing Space and the open lounge and dining area. Discover an array of unique and exciting activities to enjoy in total exclusivity. Maasai warriors guide you, sharing their ancient wisdom and local knowledge of the animals, their way of life and their secret corners of the most iconic and celebrated game reserve in Kenya – a truly authentic safari experience. Nyati House is The Owner’s Villa at Saruni Mara, one of the very few private villas in the Mara. Available on an exclusive basis, guests can enjoy the thrill of the Mara in absolute seclusion from the comfort of their very own wilderness home. Saruni Samburu is a deluxe, design lodge located in Kenya’s wild north. It is the only lodge in Kalama Conservancy, which borders Samburu National Reserve, with 200,000 acres of unspoiled wilderness to explore and enjoy exclusively. Perched on a spectacular viewpoint, its six luxury villas are open and spacious, heralding spectacular views over Kenya’s Northern Frontier District and Mount Kenya in the distance. Each villa is very private with zip fronted canvas, and large lounge areas, indoor baths and outdoor showers. Guests can enjoy the vast panoramas from the dining and lounge area, the two infinity pools and the Samburu Wellbeing Space. Nearby there is a ground-level photographic hide next to a waterhole where the famous Samburu elephant, leopard, reticulated giraffe, Beisa oryx and Grevy’s zebra gather to drink. The lodge is admired for its innovative, eco-chic architecture and interesting design and décor, as well as its Italian-inspired cuisine. You are guided from start to finish by Samburu warriors who are passionate about their land and their culture, learning first-hand about their fascinating customs and traditions and their ancient, local knowledge – a truly authentic experience. The vastness and purity of this landscape, combined with the untouched local culture, elegant comfort and welcoming hospitality makes for an intimate, exceptional and life-changing experience. Saruni Wild is a tented camp elegantly and comfortably furnished with all the necessary luxuries of a wild yet classic safari. The camp is located in the heart of the Masai Mara plains, on the border between Lemek Conservancy and Mara North Conservancy. The camp offers utter seclusion and total authenticity – guests are immersed in nature and have the unforgettable experience of being under canvas in the middle of the wilderness. Each tent is tastefully furnished and has all the essential amenities of a luxury camping experience, including en-suite bathrooms, hot showers and flushing loos, and spacious verandas with beautiful views. With only three tents in total, (two double and one family tent) makes for a seamless blend of nature, privacy and authentic safari charm. Surrounded by tens of thousands acres of pristine, untouched wilderness, the camp has the most classic Masai Mara setting. The wildlife thrive right next to its tents. Enjoy uninterrupted views, fire-lit meals under the vast African sky, guided bush walks and game drives led by experienced Maasai guides. The Maasai will host you at Saruni Wild, sharing their ancient wisdom, their local knowledge of the animals, and secret corners of the most iconic wildlife reserve in Kenya. 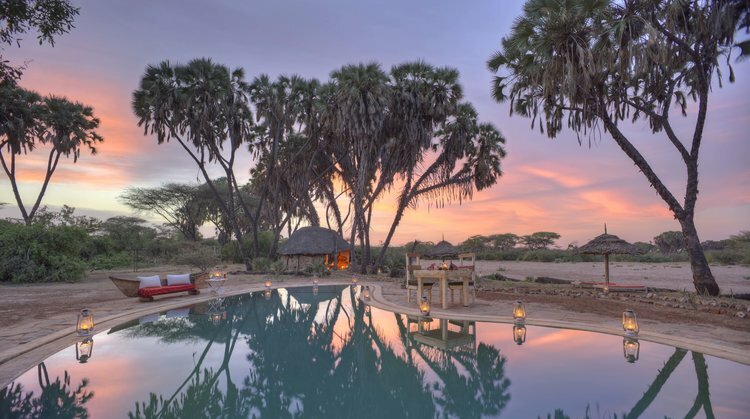 Saruni Rhino is an exclusive and intimate camp located in Kenya’s wild North in Sera Community Conservancy, 350,000 hectares of unspoiled wilderness, a little under 2 hours from our Saruni Samburu lodge in nearby Kalama Conservancy. Saruni Rhino is a 3-banda camp. A banda is a rustic stone cottage with a thatched roof and canvas roll down windows. All bandas have flushing toilets, hot & cold water and natural stone showers. Positioned along the dry river bed lined with doum palms with spectacular views of the nearby waterhole visited daily by an abundance of wildlife including the famous sand grouse spectacle. It is located a half hour’s drive from the community-owned & managed Sera Rhino Sanctuary, the first in East Africa where black rhino are tracked on foot. Guided by Samburu warriors who are passionate about their land and their culture, learning first-hand about their fascinating customs and traditions and their ancient, local knowledge – a truly authentic experience. Being on safari with a Samburu professional guide means you will not only encounter more animals, but you’ll learn how to read the book of nature through their eyes. It’s the beginning of a friendship that, for many, lasts well beyond the duration of the safari making the combined experience truly exceptional.